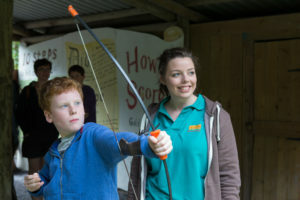 If you want something for all the family when you come to visit North Wales then Greenwood Forest Park is for you. 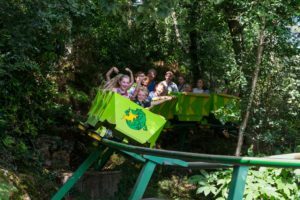 Voted the number one family attraction in North Wales for the last 6 years it is an attraction that appeals to anyone and plays its part in making and keeping tourism in Wales eco-friendly. 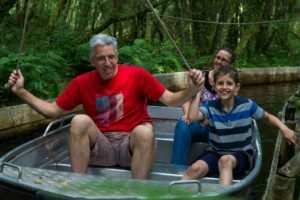 GreenWood Forest Park is all about sustainability and fun for every member of the family and has a variety of things to do with rides and more that make it must visit attraction. As many attractions as possible are eco-friendly and this includes the roller coaster, sledge run and the new water ride. Who says having fun can’t be green? The Roller Coaster is one of the major attractions of the park and it is the world’s first people-powered ride of its kind. 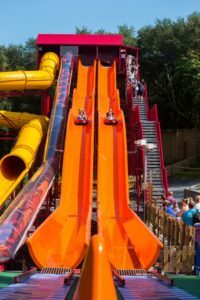 This thrilling ride carries 20 people along a crazy 250 track that includes a full 360-degree horizontal loop that will leave kids and adults screaming for joy. The whole ride is powered by people and is the greenest ride of its kind in the world… Kudos to GreenWood Park. However, it is not just the roller coaster that is green; nearly everything in the park is eco-friendly. The brand new solar powered water slide is the first of its kind in the UK and has proven to be a hit with visitors. The Solar Splash is a series of water shoots and tubes that are reached by a 64-step climb. At the top one would question why they would want to leave because the view is so spectacular, but leave they must, 80 metres down to the bottom. Excitement, adventure and appreciating nature all come together at this outstanding theme park. Another part of the fun that makes this park what it is has to be Treetop Towers and for the very little ones Tunnel Warren. Treetop Towers is a challenge for the entire family with an array of netted walkways and rope bridges strung between four towers open for exploration. Tube slides add to the fun and if mum and dad don’t want to join in they can enjoy a coffee below knowing the kids are safe to explore above. These attractions use nature for fun and make them extremely eco-friendly allowing kids to get up close with nature while having fun. Tunnel Warren is a scaled down version of TreeTop Towers specially created for under 7’s to have fun on. For under 3’s GreenWood Park has dedicated section the enchanted Woodbarn which is the perfect play space for those rainy days. GreenWood Park never seems to run out of things to do and no matter what your family is into the park can provide. The Barefoot Trail is another Welsh first and is an opportunity to kick off the shoes and run (or walk) through a sensory trail. This super green and eco-friendly attraction allows kids to experience different textures and natural elements under their bare feet such as sand, tree bark, straw and of course water, what would a run be without some wet and mud? There seems to be a never-ending amount of energy exerting attractions for the whole family at GreenWood Park but things can slow down. The team at GreenWood Park know how to make a day out really special and they bring animals into the green and sustainable mix of activities. A holiday without a donkey ride is not a holiday and donkey rides are on offer along with the chance to get up close to rabbits and guinea pigs. The natural surroundings of the park alone are an attraction and throughout the park and the resident peacocks and peahens love to show off. GreenWood Park has an endless number of things to do, and live shows and arts and crafts are all available for those who want to be a little less active. A jam packed events calendar that includes the 2017 year of legends storytelling events is all part of what makes Greenwood the number one attraction in North Wales year on year. The park may need a few days to explore and after just one day you will be exhausted and need a place to stay and unwind before heading back for more. 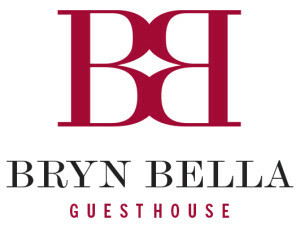 Bryn Bella Guest House is the perfect place to stay with a variety of room options available to suit your needs and only a short drive from GreenWood Park where there is so much adventure to be had you will most certainly want to come back. So why not book your family get away now at http://www.bryn-bella.co.uk and start planning the ultimate family holiday.